Invitation to all pilots/family/friends who would like to share memories of Scott Henderson. The service will have time for everyone to share memories and stories about Scott. There will be a dedication of memorial benches and a memorial boulder in Scott’s honor. There will be a fly – by with scattering of some of Scott’s ashes, and a missing man formation flown by fellow Creswell pilots in honor of Scott. Potluck to immediately follow the service. The EAA building has a refrigerator and stove so food can be prepared/warmed up on sight. Please bring your own non-alcoholic beverages, dishes and cups for each family. Main dishes and desserts to be shared family style at potluck. Some people videoed a trip into inadvertent IMC while scud running in a Bonanza. They HIT something… and amazing lived to talk about it. Available on YouTube directly as well. Yikes! Fly safe, folks! This reiterates the importance of proper ADM for sure, as the PIC in this video did not appear to exercise his. The meeting started with our wonderful hamburger/hotdog/chili Bar-B-Q at 6:00. If you don’t make it for this part of the meeting, your just missing a bunch of fun! 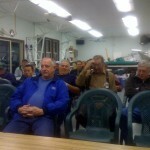 Meeting called to order at 7:01 PM by President Ben Hallert, V.P. Bill Dewey and Sec./Tres. Randy Stout were also present. The 24 members and guests in attendance then introduced themselves. Guests included Ed Biercut (?) and John Kelly. Steve Wolf of Wolf Aircraft spoke about his Turbo-Prop Lancair, which he had just flown in a low pass over the clubhouse prior to the meeting. He and Kathy will be moving to Florida later this month, so he built it to commute to see her folks back in Oregon. He spent several minutes entertaining the group with stories of his Lancair and other fun projects that he had done while working in Creswell. Steve will be missed!! Steve’s very good right arm man, Tony Horvath, will remain in the Eugene area. 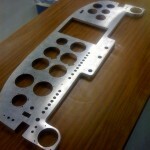 He has started his own fabrication company, Specialty Aero, LLC in Creswell (541-729-9832) (flyboyEAA@aol.com) He will be specializing in instrument panels using his 3 axis CNC machine. He brought in an example of his work, and it is very good. If you are building a RV or other homebuilt, see him before you frustrate yourself trying to build your own. David Dement still has his radio and intercom for sale. They are a KLS100GPS and a PS Engineering 1000 intercom. Call him if interested at 686-3188. Daniel Cathy had suggested that the group purchase a 8’x1.5’ banner with “Experimental Aircraft Association Chapter 31” spelled out for the next activity that the club gets involved with. Newest member Blandon Roy purchased it, an 8’x18” for $141 and it was shown to the group for the first time. Thanks Blandon! 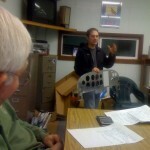 A Young Eagle report was then given by Dave Petersen. We flew 68 YE’s and made a $41 profit (which he turned over to the Sec/Treas). Randy spoke about his very short flight due to an oil cap loosening, and some discussion of the logistics for next years event ensued. The next breakfast will be held on Saturday, 17th of October. Roof work on the new patio cover will be the order of the day after the breakfast sinks in a bit. Ben Hallert then mentioned the October 24th Arlington Sport Workshop. 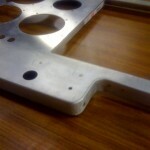 It will feature electrical installation and sheet metal basics. It includes all the tools and will cost $289 for the 2 day course. 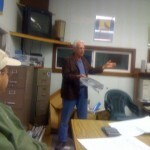 He (or was it Daniel Cathy) also noted a AOPA Safety Seminar on October 19th at 7:00 PM at the Red Lion here in Eugene. Rusty Bartel had suggested that we have a list of special tools that club members have available for loan or help. A sheet of paper was passed out and everyone wrote down the tools that you are willing to share or bring with you to help. If you think of a few that you haven’t told Rusty about, let him know. It should be a great resource. Thanks! Thanks was also given to Gary Ludeke for his loan to the club on the RV construction series of VCR cassettes. The Challenger II belonging to George Oswald was the next topic of conversation. The club moved (Dave Petersen) and 2nd ed (John Kuehl) and voted unanimously with the decision that there is not enough interest in rebuilding the aircraft, and the club would like to help the Oswalds sell it. Randy will call EAA national and talk with them about transferring the LSA paperwork to a third party. He will also call the Oswalds and confirm their interest in selling or moving the aircraft. The Christmas dinner was the next topic. Dave Petersen was asked, and accepted, the chairmanship of the event this year. His goal is to bring us a superb meal that includes Prime Rib or Salmon, potato, vegetables and rolls for $10. A-M will bring a dessert, and N-Z will bring a salad or side dish. The tentative date (to be confirmed at the November meeting) will be December 5th, with the 12th as another possibility. V.P. Bill Dewey spoke about the trials and tribulations with the county planners in obtaining a building permit for the patio cover. He ended up only spending $120 for the permit, a far cry from the $400 they wanted originally. Good work Bill!! It was noted with sadness the passing of another long time member, Bill Cowan. His funeral was on Thursday, the 8th of October. He will be remembered always for his sense of humor and smile. He served the club well as the Secretary/Treasurer for a number of years. Tail winds to you always-good friend! The clubhouse will be the meeting place for the OACAC 24th of October get together. Dave Petersen has offered to make lunch for the crowd starting at 11:30. See you there! Another call for volunteers who will share a bit of time and have the group over to their workshop after a breakfast this winter. It is a great time to see how other folks are doing on their projects and get a bit of fire back into yours! Raise your hand at the next meeting and we will all be better for it! There being no new business, the meeting was adjourned at 8:20 PM.